These pesto stuffed mushrooms are tasty and simple to create, making them at excellent appetizer for your next cocktail party. These stuffed mushrooms are one of my favorite appetizers to serve at a cocktail party. They are super tasty and simple to make, as well as gluten free and vegetarian-friendly. The cremini mushrooms make for a nice one-bite appetizer, or you can use baby portobello mushrooms if you’d like a more “fork and knife” style appetizer. 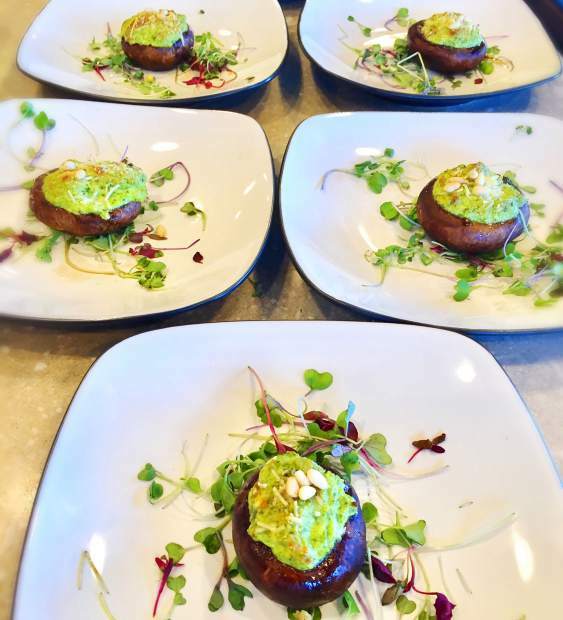 I like to buy micro greens or sunflower greens to lay on the bottom of the plate so the mushrooms don’t slide around, plus it adds a pop to the presentation. Serve this crowd-pleasing dish at your next dinner party — I promise they won’t disappoint! Preheat the oven to 425 degrees. Remove the stems from the mushrooms and clean the caps. Place the cap side up (the stem opening will be face down) on a parchment lined baking sheet. Bake for 10-15 minutes to remove excess liquid. Remove from the oven and let cool. Place mushrooms cap side down on a fresh parchment lined baking sheet. Combine the cream cheese, basil, half the pine nuts and half the Parmesan cheese in food processor until creamy. Season with salt and pepper to taste. Use a spoon or a pastry bag to fill each mushroom. Sprinkle the tops with some of the remaining Parmesan cheese. Bake for 10-15 minutes or until the tops start turning golden brown. Place on a serving tray or plate and garnish with the remaining pine nuts and Parmesan cheese.